I don't know that many people would say they have a list of favorite board game designers, but Carl Chudyk is definitely one of mine. His games have a fascinating way of assigning many different meanings to a relatively small number of components, which means that his games and the decisions within always feel a lot bigger than the sum of their parts. 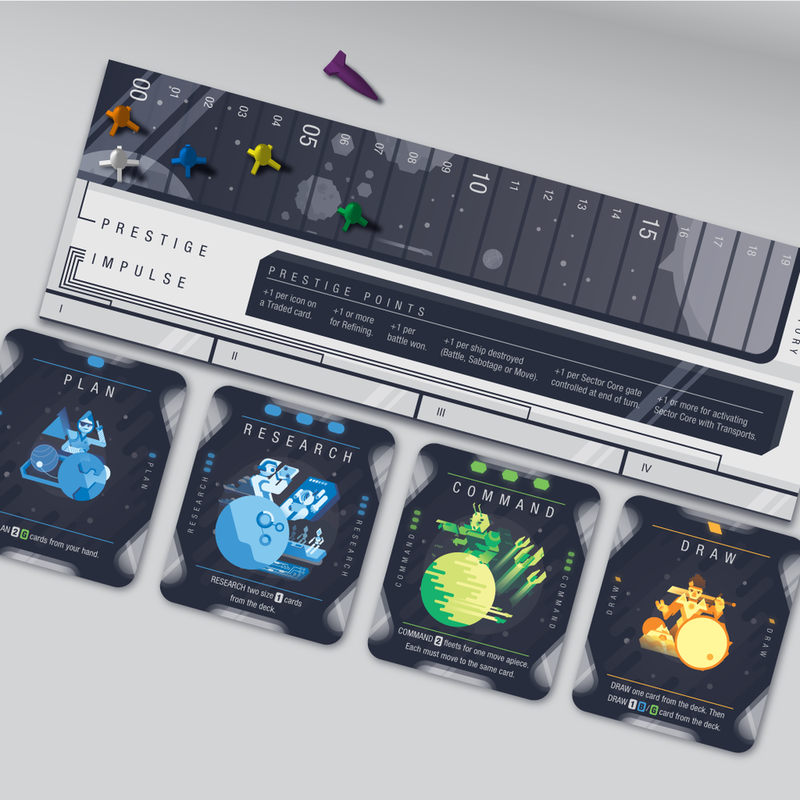 Impulse is a game of space exploration, colonization and conquest designed by Chudyk and released in 2013. It creates an epic sci-fi narrative using little more than a single deck of cards and a handful of tiny, plastic spaceships. After playing a good deal of Impulse and declaring it one of my favorite board games in my collection, I started toying with the idea of designing my own version of the game for fun, both as an experiment in creating the user interface for a game and as a way to create some art for a subject that I find inspiring. There is a deep, interconnected and unique story that unfolds in every game of Impulse, so I decided to focus on this narrative element throughout my redesign process. The heart of this board game is its cards, and it is with these cards that my redesign process began. Impulse is played with only one deck of cards, however, each card can represent a myriad of different things depending on how it is played. Some cards form an interstellar map of planets to be explored by the players while others represent the various actions they perform. After exploring different ways of representing this multi-faceted quality, I decided to use a collage style of illustration to convey the multiple meanings imprinted on each card. And because one of my goals with this redesign was to highlight the narrative component of the game, I used the card illustrations as a way to create interconnected vignettes across multiple cards. For example, the illustrations for the game’s “RESEARCH” cards show a scientist who first engineers an alien monster, then dissects one of its tentacles and finally is attacked by his own creation. There are 10 different actions types in the game, each of which contain numerous individual card abilities. In total, I did over 40 unique illustrations for the cards. The design for the rest of the game’s components followed from the visual style I created for the action cards. I developed player boards, giving each one a faction identity connected with its unique abilities. Working from the design of the player boards, I also redesigned the game’s scoring track making adjustments to the user interface along the way. Finally, I designed a box for the game, leveraging the assets created for the card illustrations to add to the game’s atmosphere and hint at the story within, waiting to unfold. Throughout this process, I made a point of testing components on other gamers as I developed them, gathering feedback and striving to improve my designs all along the way. The most rewarding thing for me has been using my work as a way to share one of my favorite games with others and, every once in awhile, seeing the look on someone’s face when everything clicks and the design helps them see just how fun this game can be.